I was so excited when I was contacted by a representative of POM Wonderful 100% Pomegranate Juice and offered the opportunity to try their product!! I had been curious about it for some time and wanted to try it, but I had no idea the variances in quality that other pomegranate products may have, nor did I realize the incredible health benefits this product provides - benefits that are backed by science and not hype! Did you know that "Wonderful" is actually a variety of pomegranates? The variety that has been found in clinical studies to provide significant improvements in cardiovascular function and for men, showed improvement in prostate & erectile health. 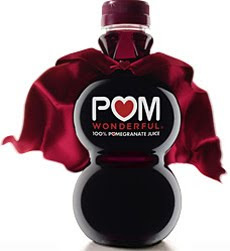 POM Wonderful is the only juice that is guaranteed to be made exclusively from this variety. Other brands, often made with juice from foreign countries, and sometimes containing inferior filler juices and colorants, even when labeled as 100% juice! POM Wonderful orchards are located right here in the U.S. in California's San Joaquin Valley, and is guaranteed to be 100% Wonderful pomegranate juice, containing no added sugars, preservatives, artificial colors or filler juices. Don't worry ladies, because of its powerful antioxidants, POM Wonderful has many benefits for us too. It is a superior source of antioxidants - better even than red wine, grape juice, blueberry juice, cranberry juice, green tea, vitamin C and vitamin E! Dr. Michael Davidson, Director of Prevenative Cardiology and Atheroscierosis Research at Rush University Medical Center was quoted in the Chicago Tribune as saying "it's the concentration of the polyphenols that appear to make [pomegranate juice] the most potent antioxidant in nature." That's powerful! Pomegranates are one of our earliest cultivated fruits being first planted sometime between 4000 BC and 3000 BC! Some scholars believe it was not an apple depicted in the Garden of Eden, but perhaps a pomegranate and for many years, it has been held as a symbol of health, fertility and rebirth. Some cultures believed that it had mystical healing benefits. And then of course, like other 100% juices, you can cook with it! Its deep crimson color and delicious taste make it so easy to work with and perfect for the holiday season. ►First, of course, I tried a glass of it straight up over ice. It's got an accumulated taste for some, but I loved it! I can totally see making this juice a daily part of my life. ►Next, I decided to make a cocktail and used some of it to make Pomegranate Cosmopolitans. ►Then, I made Spicy Pomegranate Cranberry Sauce for the holidays. ►And next, I made a Cranberry Pomegranate Holiday Sangria. ►And last, I made Pomegranate Cranberry Chicken - a cranberry dish that is familiar to many of us - but this time, I added the POM Wonderful 100% Pomegranate Juice in with the cranberry sauce, and it was fantastic! Such a versatile juice - and now YOU have the chance to try it for FREE!! Update: Check out all of my recipes using POM! The Giveaway is CLOSED. Congrats to the Winners!! Disclosure: POM Wonderful 100% Pomegranate Juice provided me with the product & health information and free product to sample and evaluate in the hopes that I might share my findings with my readers. POM Wonderful is also providing free product for this giveaway. Please see the button at the top of my blog for details on my PR Policy and additional disclosures in the footer of this blog. All information regarding any health benefit of this juice was provided by POM Wonderful 100% Pomegranate Juice and is intended for your general knowledge only and is not a substitute for health, nutrition or medical advice or treatment for specific medical conditions. You should seek prompt medical care for any specific health issues and consult your physician before starting a new nutritional, disease treatment or fitness regime. Wow...I have always wanted to try that particular product too and now that I know you can cook and bake with it...well...how fabulous is that!!!! I personally would love to try this particular recipe because my hubby is a cupcake addict! POM Velvet Cupcakes with POM Cream Cheese Frosting. I am also a follower of your blog. I sent a tweet about your contest over on twitter and copied your tweet. My twitter ID is @Ravish30 so you should see that tweet in your @replies. That's the one that I would try. I have been a fan of POM for a long time... and they are very friendly to bloggers... and the Pom martinis are killer.. I would make more and more and more! I would love to try the POM-Glazed Baked Squash and Apples but there are about a ton of other recipes that sound wonderful, too! I am forwarding a link to my hubby so he can check them out! Great giveaway! I just sent another tweet about the contest. I would love to make POM Velvet Cupcakes with POM Cream Cheese Frosting the color is so pretty and I'm sure they will taste delicious. I love trifles, so when I saw the recipe for POM and Roasted Pear Trifle, I knew it was something that I would have to try! Yum! Geez Mary, all the recipes look great! I really liked the Pomegranate Squash Risotto. And your chicken over at deep south dish looked pretty fab too! I follow as you know. my email is kcscott1 at gmail.com. I would like to try the Pear Salad with POM Honey Dijon Dressing and Blue Cheese Crumbles. I also made the Spicy POM cranberry sauce for thanksgiving and it was a hit!! Oh the recipes look wonderful, no pun intended. I would like to try POM Velvet Cupcakes with POM Cream Cheese Frosting They look fab! Ok Mary here's another one! hey girl...I have not been around too much...and my hip is an old injury from when my youngest was born...she was an almost 10 pound monster at birth, and when she was 6 months old, I crossed my legs and gave her the "horsey ride" that popped my right hip out...and it has never been the same since. In and out often and always sore! I am fine, almost ready to post my big reveal of a huge project that has taken up all of my blogging time! Then...on to the Christmas decorating that I am officially a month behind! I'd love to try the POM brand, but I love pomegranate juice. I just tweeted about the contest again over on twitter. I've always wanted to try this. I love pomegranates! ?Think I'd like to try the Blushing POM Holiday cheesecake. I would love to try the Pomegranate Red Curry with Green Tea Infused Basmati Rice. As a vegetarian, it is sometimes hard to find great recipes and this looks like a winner! I am woefully technologically behind, so am unable to twitter or follow you, but like your blog. I would try it plain first - then go straigh to making POm velvet cupcakes. Oh - sounds yummy! Loved the Proscuitto Wrapped Halibut with Pom Glaze - nice change from citrus - the sour note here comes from the pom seeds and juice. pic is great. I picked that one too! Halibut is tricky and I liked the method of crispy cornmeal and salty proscuitto in the pan and finishing the cooking in the oven. I agree, the tang from pom is a nice and healthy change! Halibut with pom - sounds good too! I checked it out and the cooking method is great (pan brown first, oven next). Will try it - what a healthy alternative to steak or hamburgers. I tweeted again about the contest over on twitter. I had no idea there was no many ways to use pom. But I'd love to try the POM Passion Smoothie. SOunds delicious. GIVEAWAY IS CLOSED! Thanks for participating and stay tuned for the winners listing. Yeah I won! Thank you so much for the opportunity Mary ♥ I twitter when I can't sleep, POM is a great bonus. And, believe it or not, this will be my first time using POM. Yeah! I just sent you an email. I can't wait to try out some of those POM recipes! Mary, I got the POM today and I immediately had to make a recipe. Since I had all of the ingredients on hand...I made the Pom Roasted Chicken for dinner tonight and my hubby and daughter loved it!!! I am sipping on some iced POM juice as I type this. I took a picture of the roasted chicken and will be blogging it in a few days. It was absolutely delicious! Thanks to your fantastic contest/giveaway we are now POM fans! A huge thanks to POM for sponsoring the giveaway! Can't wait to see the recipe Shelly!! Isn't it good stuff? Yay!! Welcome & thanks for taking the time to comment! From time to time, comment moderation may be activated due to comment spam. I also reserve the right to edit, delete or otherwise exercise total editorial discretion over any comments left on this blog. All content and images, including any not yet watermarked, are ©My New 30 2008-2017, unless noted otherwise. You are free to print articles for personal use, but please do not republish anything from this site without prior written permission. All rights reserved. Is someone stealing your content? Click here to find out what to do. Looking for my recipes? They've moved to a new home at Deep South Dish. Click over and visit! USDA Hardiness Zone Finder - Find What Gardening Zone You Live In.